Preservation history is being made with two unique Victorian London and South Western Railway steam locomotives – one from the Isle of Wight and the other from Dorset – together hauling trains on the Swanage Railway. The special three-day all-Victorian steam event featuring 02 class tank locomotive No. W24 ‘Calbourne’ from the Isle of Wight Railway and M7 class tank locomotive No. 53 from the Swanage Railway started yesterday, Friday, 25 May, and continues until the end of Sunday, 27 May, 2012. It is the first time in 88 years that the Victorian ‘Calbourne’ has left the Isle of Wight for a working visit to the mainland. Throughout yesterday Friday, ‘Calbourne’ worked an authentic Southern Region 1950s freight train while on the Saturday and Sunday, the Victorian locomotive built in 1891 will operate a two-train passenger service with fellow Victorian tank engine, M7 No. 53 built in 1905. The two railway veterans hauled the final passenger train of the day on the Friday – a railway practise known as double-heading. Swanage Railway commercial manager Martin Payne said: “This all-Victorian stream weekend is the first time that two Victorian London and South Western Railway 0-4-4 wheel arrangement tank locomotives have worked together and it’s unlikely to ever be repeated. “Both the Isle of Wight Railway’s ‘Calbourne’ and the Swanage Railway’s M7 No. 53 are the only working examples of their locomotive class in preservation. “It is a very special and exciting event and we’re very grateful indeed to the Isle of Wight Railway for its generosity in allowing its delightful locomotive to cross the Solent and spend three days working in Dorset,” explained Mr Payne. While ‘Calbourne’ hauled nostalgic freight trains on Friday, 25 May, 2012, M7 tank No. 53 and Southern Railway 1940s West Country class Bulleid Pacific No. 34028 ‘Eddystone’ hauled a two-train passenger train service with departures from Norden Park & Ride and Swanage every 40 minutes. 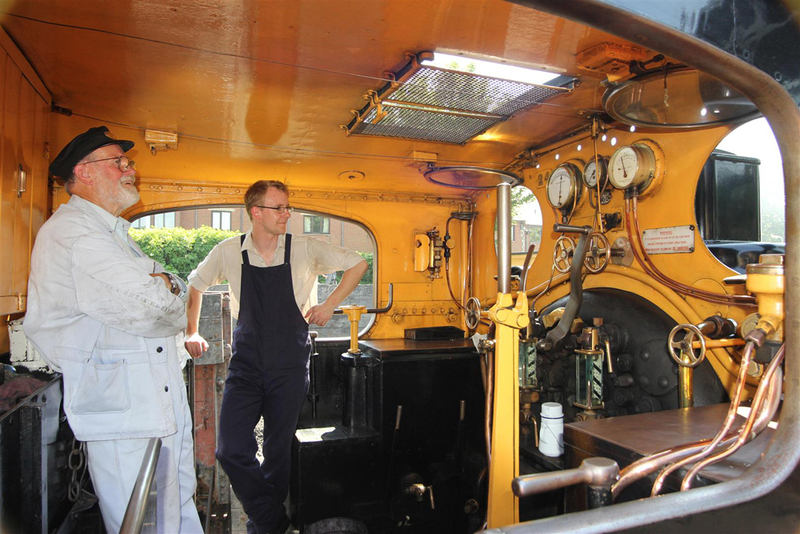 Swanage Railway deputy operations manager Matt McManus explained: “Built in 1891, No. W24 ‘Calbourne’ is the sole survivor of a 60-strong class of steam locomotives and first operated from the Fratton depot near Portsmouth and then Exeter for the London and South Western Railway before the formation of the Southern Railway in 1923. “There was a shortage of steam locomotives on the Isle of Wight by the early 1920s and the situation was becoming desperate but, luckily, it was the electrification of the mainland suburban railway that came to the rescue. “The electrification meant newer and more powerful steam locomotives, such as the M7s and the T1s, could replace the 02s in their rural strongholds such as the Swanage branch – with several 02s becoming surplus to requirements. “Two of these spare 02 steam locomotives were equipped with Westinghouse air brake systems at Eastleigh Works in Hampshire so they could work with coaching stock on the Isle of Wight,” explained Matt. The two modified 02 class steam locomotives were shipped across the Solent to the Isle of Wight in 1923 and trialled extensively on railway services across the Island – particularly the intensive Ryde to Ventnor services where the locomotives were highly successful. Shipped to the Isle of Wight in April, 1925, London and South Western Railway 02 No. 209 was allocated the Island number W24 and given the name ‘Calbourne’ after a pretty village on the Island. 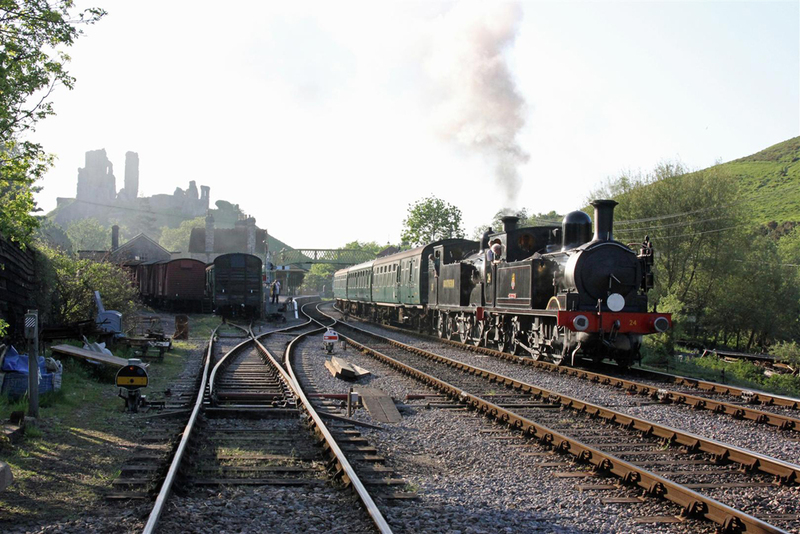 To find out about many other Swanage Railway special events and train services on the relaid Purbeck Line – visit www.swanagerailway.co.uk or call 01929 475207. (Awesome!) Photos by Andrew P.M. Wright.